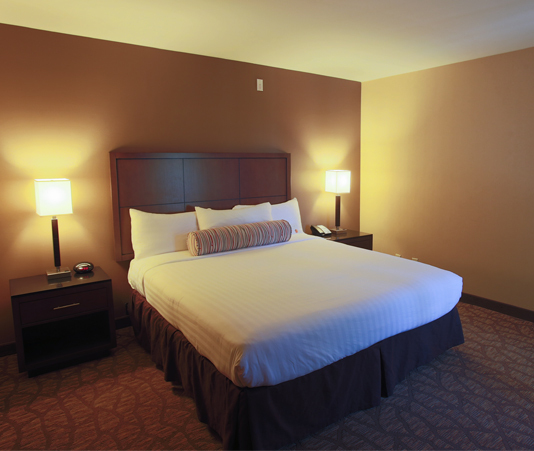 Airtel Plaza Hotel at Van Nuys Airport features 267 spacious, smoke-free guest rooms and suites, including newly renovated Preferred guest rooms and suites with granite bathrooms, glass-enclosed showers, and refrigerators. 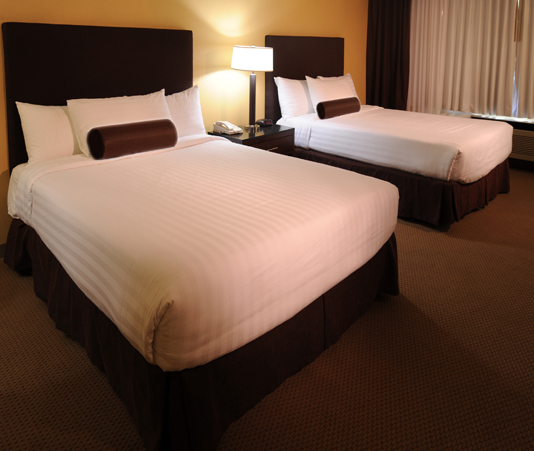 All are attractively furnished and have Serta beds with goose-down pillows and flat-screen televisions. 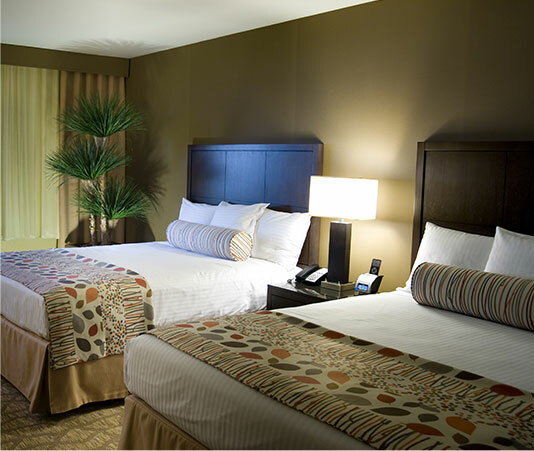 Accessible rooms are available upon request. Please call 877.939.9268 24/7 to reserve accessible rooms, or if you have any inquiries or special requests prior to your arrival. Featuring pool and garden views, our newly renovated Preferred Double Queen Rooms measure 365 to 430 square feet and have two Serta queen beds with goose down pillows, a 37" flat-screen TV, lamps with convenient electric outlets, and spacious bathrooms with granite counters and glass-enclosed walk-in showers. 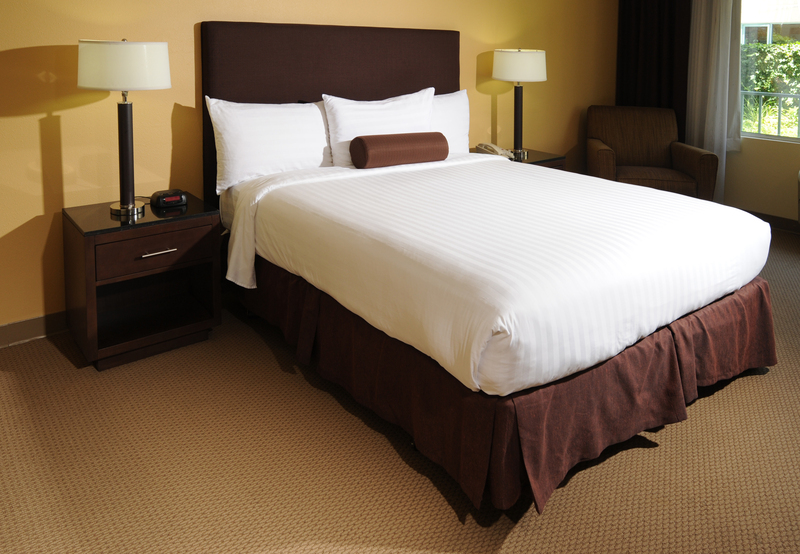 Measuring 365 to 430 square feet, our newly renovated Preferred King guest room features a luxurious Serta king bed finished with goose down pillows, a 37" flat-screen TV, refrigerator, and spacious bathrooms with granite counters and glass-enclosed walk-in showers. These rooms offer views of the pool or garden. Overlooking the pool, courtyard, runway or city, our Traditional King guest room measures 365 to 430 square feet and features a king Serta bed with goose down pillows, 42” flat screen TV, AM/FM clock radio and combination shower/tub. 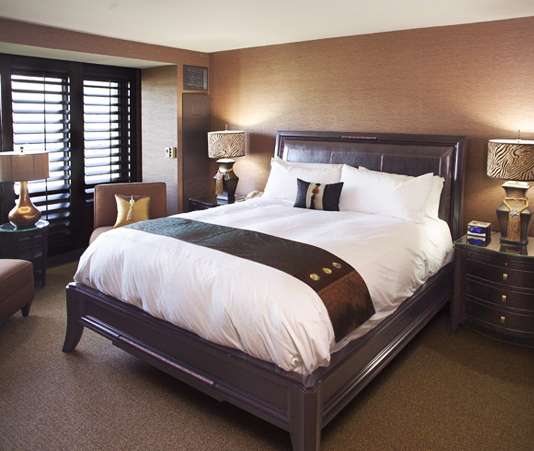 Featuring pool, courtyard, runway or city views, our Traditional Double Queen guest room measures 365 to 430 square feet and features a two Serta queen beds with goose down pillows, 27” TV, AM/FM clock radio and combination shower/tub. 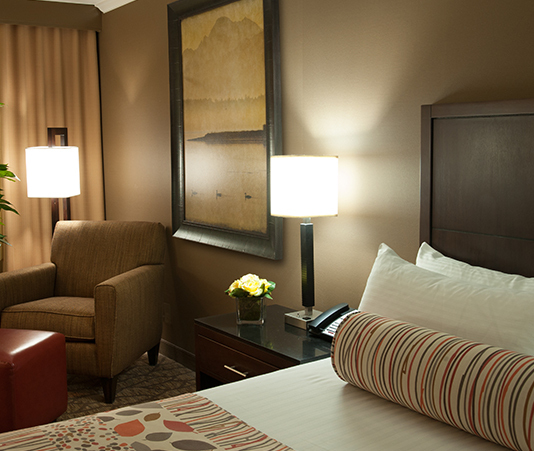 Ideal for entertaining, our 520-square-foot Traditional One-Bedroom Suites are spacious, light-filled corner rooms with a king Serta bed with goose down pillows, refrigerator, wet bar and 42” flat-screen TV. 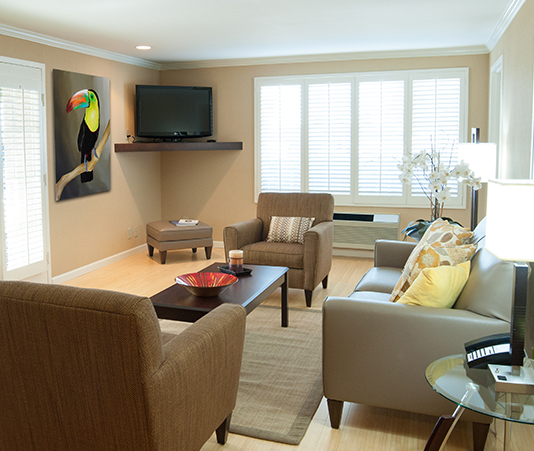 Some have separate living areas with private balconies. Other features include an oversized double vanity in the bathroom, AM/FM clock radio and combination shower/tub. Offering the ultimate in indoor/outdoor living, our Outdoor Terrace Spa Rooms span 755 square feet and feature an ultra-spacious private balcony with jetted tub, chaise lounge and bistro dining table with umbrella. Other furnishings include a queen Serta bed with goose down pillows, a 42” flat-screen TV, refrigerator, AM/FM clock radio, and combination shower/tub. Perfect for entertaining, our newly renovated Preferred Hospitality Suite measures 700 square feet and features French doors open onto a mini-balcony with views of the runway and pool. Features include a king Serta bed with goose down pillows, two 42” flat-screen TVs, refrigerator, and two glass-enclosed walk-in showers. 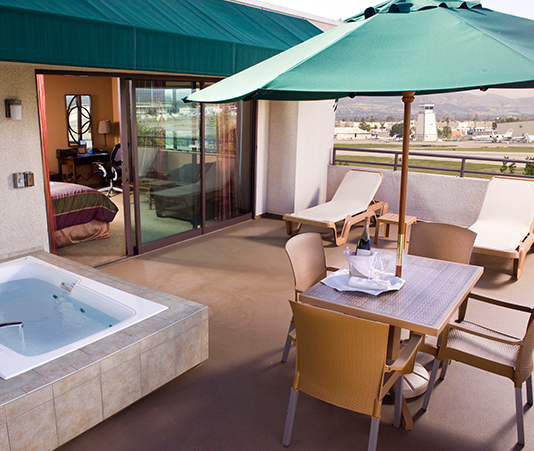 Our most luxurious retreat, the exquisite 1,080-square-foot Presidential Suite features a spacious private balcony with views of Van Nuys Airport, as well as a king Serta bed with goose down pillows, two 42” flat-screen TVs, and large bathroom with double vanity, glass-enclosed walk-in shower and separate tub. The kitchen pantry has a full refrigerator, microwave and Keurig coffee maker.